The ANCIENT INDIA & IRAN TRUST. Cambridge, England. “The day will most certainly come when all archives and museums have their collections photographically catalogued using video technology” This prediction in the early 1970s was the first sentence Professor Howard Wilson wrote as an introduction to the proposal he was initiating for his Sri Lankan Photographic Archive. Professor Wilson’s intention was to bring together in an easily accessible archive, the art traditions of an entire nation. 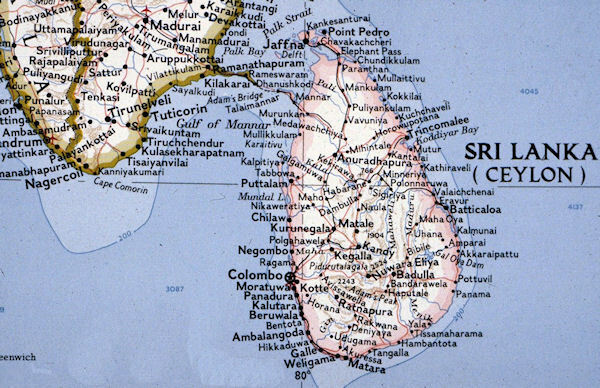 At the time (1970), Sri Lanka was focused on re-establishing its identity, not as colonial Ceylon, but as an ancient and noble kingdom of Sri Lanka. In this important transition, Sri Lanka could serve as a template for the developing world, thereby contributing to cultural understanding and facilitating the building of bridges between East and West. At the time of his death in 1998, Professor Wilson had completed the most time consuming part of his project. Over a fifteen year period not only did he photograph in the caves, museums, and private collections in Sri Lanka, but in significant major museums around the world. He then organized in file form, not only his photographs, but images from his colleagues as well. In this process he continued to receive enthusiastic support from educational institutions and major museums, as well as the cultural communities they served. After Professor Wilson’s death, his widow, Mrs. Marti Wilson, decided to attempt the completion of this project. She found a ‘home’ for the project at the Ancient India and Iran Trust in Cambridge, England. It soon became apparent that, because Professor Wilson had not finished work on this project by the time of his death, several mysteries remained. For that reason Mrs. Wilson chose to digitize only her husband’s work. The contributions made by his colleagues are valuable and can be accessed by contacting the individual named. A list is provided at the end of this article. Additionally, while every effort has been made to ensure accuracy, mistakes will likely be found in the database. For that reason, we invite the researcher to inform us of any corrections needing to be made. You may easily access brief summaries of the eight subjects listed under Howard Wilson Archive in the menu above. There will be an arrow at the bottom of each section allowing an easy progression through the archive. The island of Sri Lanka is believed to have the longest continuous Buddhist history in the world. It was one of the first mission fields of Buddhism outside India, dating from Emperor Ashoka�s reign (269-232 BCE). The Emperor sent his son, the Bhikkhu Mahinda, to Sri Lanka where he succeeded in converting King Devanampiya Tissa (250-210 BCE) to Buddhism. In its homeland of India, Buddhism never became the sole religion, which would have united that vast population into a single culture. In the Indian tradition, the ruler was to preserve and support all religions. As a consequence, India retained its heterogeneous culture. More orthodox Theravada Buddhism was displaced in much of India by Mahayana, the broader path. As Mahayana developed, it became less a way of life and more a system of metaphysical speculation. By contrast, the Theravada tradition nourished a distinctive way of life and a particular form of culture called the Buddha-Sasana, which has proved the more enduring. In time, the Buddha-Sasana defined the national identity of Sri Lanka, and a cultural synthesis was created in which the arts flourished. As a young Prince, the Buddha renounced his kingdom to seek the meaning of life. He did not intend to found a kingdom. The stories (Jatakas) of the Buddha’s life journey and enlightenment can be seen in most of the cave paintings in the archive. 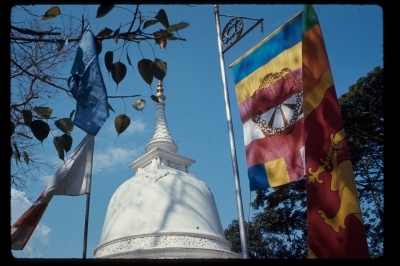 The image on the right shows icons that serve to introduce the study of Sri Lankan Buddhist culture which will be explored further on the following pages: A Shrine (Dagaba/Stupa); the National flag; the Buddhist flag; the Maha Bodhi tree under which the Buddha received his enlightenment.